Yet he has painted no sensational scenes in the Philippines, which may disappoint some morbid expectations. In a way Amer­ica has fared better at his hands than other nations. It is said that the French did not enjoy his portrayal of Napoleon's retreat from Moscow, along a drifted highway strewn with dead and dying men. Neither did our transatlantic cousins find his representation of Sepoys blown from British can­non palatable - that long line of white-robed natives bound to the muzzles of the great guns under the sunny Indian sky. and the squads of disciplined gunners calmly await­ing the order to shatter each helpless human frame into bleeding frag­ments. It has been more than whispered that Russia frowned upon his pic­ture of a wholesale hanging of Nihilists - two corpses already dangling; many more high gallows­ trees awaiting their ghastly fruit; a strong military force drawn up in hollow square about them under gray wintry heavens from which "feathered rain falls softly down. " And when to these last two he added a realistic picture of the Crucifixion and grouped the three scenes of execution together, with the implication that they were equally abhorrent, then indeed there was deep displeasure in both church and state. The worst that he has shown in the Phil­ippines has been the inevitable suffering, bloodshed and endurance. His only pain­ful pictures are the set which he entitles "The Interrupted Letter: A Poem in Paint. " 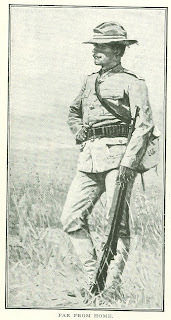 This begins with a cavalryman sa­luting as, with blood pouring down his face, he answers his officer. "You're hit, Ser­geant?" '"Yes. sir." Next comes '"In the Hospital," where he is borne in on a stretcher. Then in "Dear Mother" he lies bandaged on his narrow iron cot, dic­tating a letter to a nurse who sits beside him in her neat cap and cleanly uniform. There follows "The Letter Is Interrupted," where the wounded man has fallen back on his pillow and the nurse is anxiously feeling his pulse. In 'The Letter Lies Unfinished" yon see the paper forgotten on the floor at the foot of the bed where the writer lies stark, and you know that it never will be finished. These distressing pictures are certainly not objects of sensuous beauty, if that is what works of art should be. There are merely the white iron bed, the bare, white­washed wall, with the mosquito netting drawn back against it, for setting to the livid sufferer and the calm, serious young woman in her light cotton gown. A pro­fessional nurse who saw it in Chicago. how­ever, could not praise it enough for its faithful depiction of a hospital scene. Why indeed should it not be faithful? It not only was painted from actual fact in a Manila hospital, but had been, so to speak, actually experienced by the painter. When he saw. the American soldier endeavoring to send a dying message home like a flash his mind went back to his own unforgettable feelings as years before he lay in hospital on the banks of the Dan­ube with what was believed to be a mortal wound and in his turn painfully dictated his last wishes to his attendant. 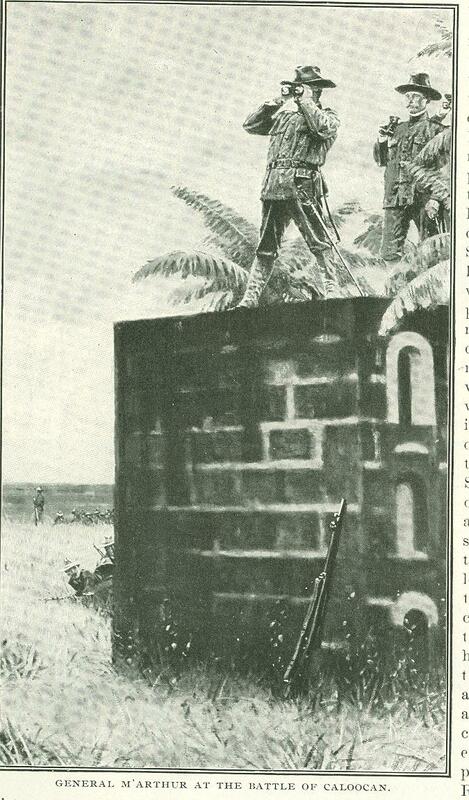 Two of his Philippine pictures point to a drumhead court-martial. One shows the interior of a small dark hut where cavalry officers of the vanguard are inter­rogating a deserter to discover whether he is a spy. There is an air of caution and secrecy about it. A single candle on a rough deal table faintly illumines four in­tent bronzed faces and throws exaggerated shadows on the wall behind. The other scene is Out of doors, with palms, white tents and groups of soldiers for the back­ground. Here a spy clad in light uni­form, with arms bound, is brought before the officer in command, who sits in front of his tent. Other works are simple, straightforward battle pictures. 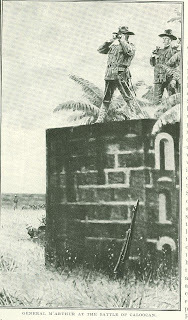 One represents General MacArthur and his staff watching the progress of the battle of Caloocan from the top of the queer, block-like tombs near the church of La Lorna. From this entrenched cemetery, occu­pied by Colonel Frost and his regiment, the entire fight was plainly visible, and it was probably the most picturesque during the whole insurrection. Strong entrench­ments had been constructed over the rail­road bed just north of Caloocan, where some artillery was used by the insurgents. 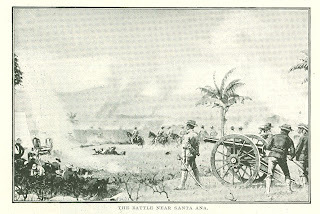 The Third United States Artillery, commanded by Major (now General) Kobbe, was seen to move as if in extended order drill, never losing the regularity of its formation or the control of its fire. 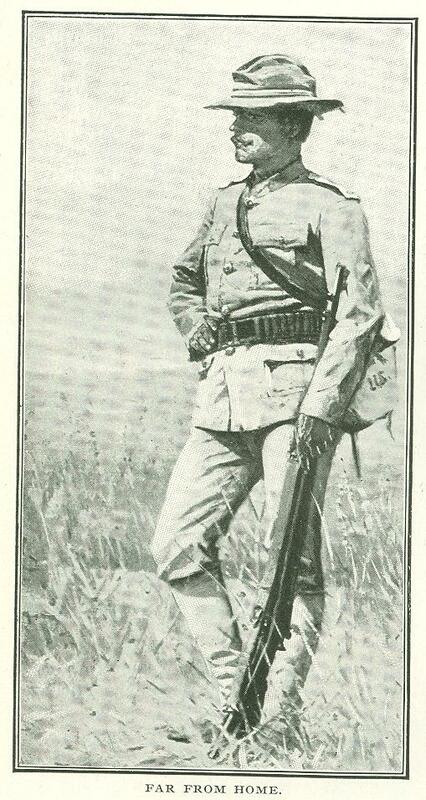 An eye-witness men­tions seeing the meeting of General Kobbe and General (then Major) Bell, who chatted for several minutes under heavy fire, when one of them drew out a cigar, lighted it and smoked with perfect composure. 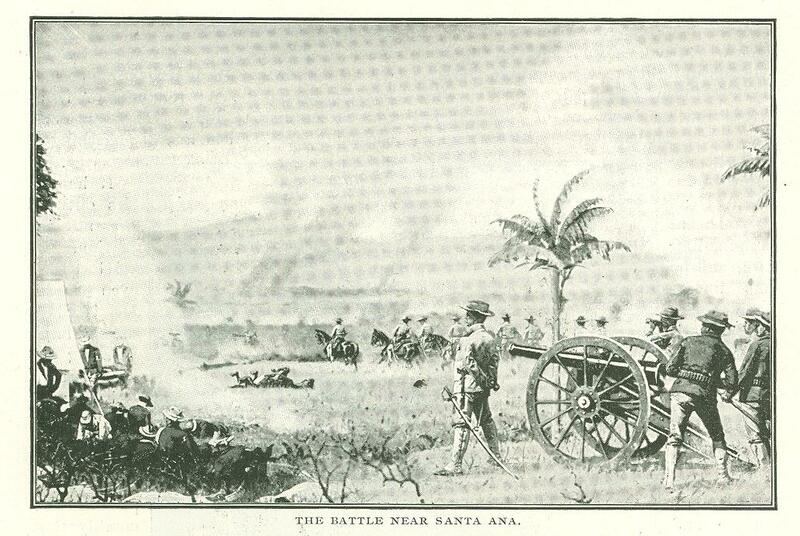 Another battle witnessed and painted by Verestchagin was that of Santa Ana near Manila, in which General Charles King, well known for his novels of army life, was in immediate command of the line in front of Santa Ana. The fight began at daybreak and was stubbornly contested for several hours. In one trench, about fifty yards long, thirty-five dead Filipinos were found. While their entire casualties were never accurately known, from the number that were buried next day it appeared that approximately three hundred. were killed and twice as many wounded. Of the Americans, fourteen were killed and about sixty wounded. Whatever may be the Filipino's capabilities for civilization and self government, there seems no doubt of his courage and fighting power. 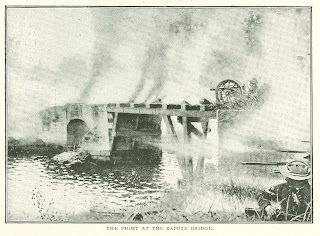 The picture of Zapote Bridge shows the mountain artillery, which was worked at the very close range of thirty-five or forty yards, the men at the guns kneeling or lying down. "The thin blue mist off there," Verestchagin explains, "is from what is called smokeless powder. Yes, it is perceptible when much firing is going on, although, of course, not to the same degree as the thick white smoke from the old-fashioned ammunition." "War," said Sherman, "is hell." And Verestchagin reaffirms the terse utterance with all the power of his brush. While in Chicago, he occupied the pulpit of All Souls Church and preached a sermon on peace. He is a dramatic speaker, though slightly hampered by his foreign accent, but as the pastor afterward said to him, "Your paintings are your most eloquent plea for peace." These are almost the words of the German Emperor, who said to him in Berlin, "Your pictures are the best preventive of war." He has had many such tributes. The Emperor Alexander of Russia declared of his painting of the battle of Plevna: "It is all so. That is the way it really looked. General Skobeleff, the dashing cavalry leader, on seeing the picture of his troops after the victory at Scheinovo, embraced the artist in his headlong enthusiasm. When the veracity of Verestchagin's show­ing of the terrible Balkan roads, strewn with mutilated and frozen men, was ques­tioned, Frank D. Millet, American artist and war correspondent, came forward and testified that he too had beheld that grisly scene. When his representation of a priest blessing the slain on the battlefield was doubted, witnesses endorsed its truth. Vasili Verestchagin is a man close on to sixty years, but vigorous and commanding, with an upright carriage, aquiline features, a grizzled beard and a pair of piercing eyes. His career has been one of contrasts and adventures. He has lived the life of the over-refined Pa­risian in his luxurious studio at Maisons-Laf­fitte, and he has under­gone expo­sure and pri­vation climb­ing the un-­trodden snows of the Himalayas. He has known the courts of Europe and their sov­ereigns, and he has fre­quented the rough taverns of Siberian mi­ners. He beheld the Prince of Wales in In­dia on his caparisoned elephant with jeweled rajas in his suite. He has also heard the Mohurrum drum beat, and watched Oriental fanatics rushing through dirty, narrow streets gashing themselves and shouting: "Ya Hasan! Ya Hussain!" He has received the highly valued cross of St. George for holding a town against odds of ten to one till the Russian troops could relieve it, and he has offended the Russian authorities by his daring pictures. He is a genuine cosmopolitan, speaking many tongues. All Eu­rope is familiar to him. He knows odd corners of Asia, and he knows something of America. If he car­ries out his present in­tention. he will know even more. 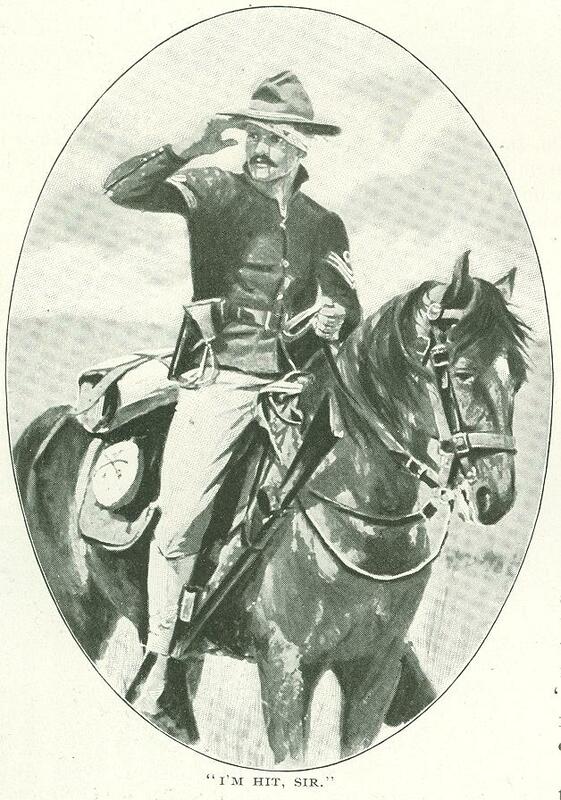 He is plan­ning a large painting of the Rough Riders charge up San Juan Hill, wherein will be many portraits, notably that of one Colo­nel Roose­velt. He wishes dur­ing this sec­ond trip to the United States to go on to Cuba and make studies of the historic locality. So that Ameri­cans who thrilled with his first bat­tle pictures, and have again welcomed his epic of Na­poleon's Russian cam­paign and his war scenes in the Philippines will probably at some time in the not far distant future behold a work of his master­ful brush that will touch them even more closely. Originally published in Cosmopolitan Magazine. July 1902.